A remote village in Arkhangelsk Region has preserved a unique way of life in harsh conditions. The village of Kimzha in Arkhangelsk Region, is one of the most significant surviving traditional settlements in the Russian north. Kimzha is situated close to the Arctic Circle, near the point where the small Kimzha River flows into the Mezen, one of many waterways that drain northern Russia. The mouth of the Mezen River is flanked by two towns, Kamenka and Mezen, both about 5,000 in population. Mezen is the regional administrative center, Kamenka has the region's largest employer, a lumber factory. The population of Kimzha varies between winter and summer: a couple of hundred in the winter, with a hundred or so more at various times in the summer, when relatives return to visit parents and grandparents. Its primary landmark is a church, dedicated in 1763 to the Hodigitria Icon of Mary. For much of the year, Kimzha lies buried under severe winter conditions, stiff wind and treacherous snow drifts. At one time, there was limited scheduled transportation by water from Arkhangelsk, but that ceased to exist long ago. Today year-round transportation option by small plane is available from Arkhangelsk’s Vaskovo airport to Mezen, and from there by car (and boat) to Kimzha. During the winter there is a temporary road, or zimnik, but this is an exhausting, nerve-wracking route, whose usefulness has been curtailed in recent years by the ever earlier spring thaws. An year-round dirt road is nearing completion and will, in theory, open the way to Arkhangelsk. In the meantime, Kimzha continues in its traditional ways. The place has a certain magic perhaps best represented by the aquamarine shimmer of the aurora borealis that can be seen from here. And the village itself makes an extraordinary impression, with its massive log houses built in the late 19th and early 20th centuries. Although some houses have been abandoned or shuttered for the winter, and others have been modified with plank siding, this is not an open-air museum with a few reconstructed log buildings. Kimzha is a living environment. 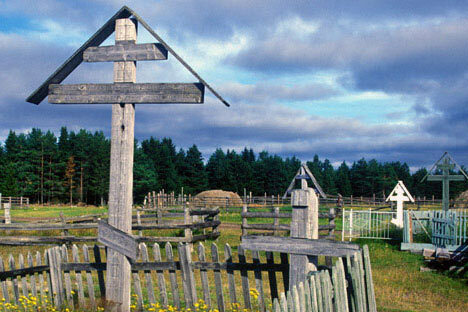 Some residents are employed by the village administration, others live on the remnants of agriculture, and others have connections with the lumber plant in Kamenka. Although the former dairy kolkhoz, surrounded by rusting machinery, has withered, a large part of the dairy herd is now individually owned. The villagers are also sustained by the berries and mushrooms of the forest and the fish of the waterways. Locals are adept at growing and preserving much of their own food. Nonetheless, modern life requires certain amenities that are difficult to provide in this environment. With so many complications, the preservation of Kimzha—the buildings and the community—seems remarkable. While many former residents of Kimzha have left for work elsewhere, this emigration has helped Kimzha retain its age-old dimensions. And the arduous journey required to reach the village has also protected the integrity of its environment. Yet these factors alone cannot explain the survival of Kimzha, when hundreds of other villages throughout the north have vanished. It appears that the physical existence of the church has played a major role in the village's endurance. With its tall, vertical form--over 27 meters (88 feet) high—the Hodigitria Church defines Kimzha from every perspective. The Russian north was rich in examples of log churches, such as the famous Transfiguration Church on Kizhi Island with its 22 domes, but the Kimzha church is the sole surviving example of its type—a high central tower and cupola closely flanked by four small cupolas. This style was created by a group of carpenters active only in this part of the north, near the Pinega River. Begun in the early 18th century and consecrated in 1763, the Kimzha church has survived decades of neglect and the threat of accidental fire. In the 1870s, its stout logs were covered with plank siding, painted white with blue and green trim. At the same time, a bell tower was erected over the west porch. (An earlier bell tower stood separate from the church on the bank of the Kimzha River). Soviet restoration practice frowned on such 19th-century cladding, and in the 1980s some of the planks were removed. Lack of funds halted the restoration, and the church remained as a textbook display, half with plank siding and half without. In 1999, a dedicated church committee succeeded in having the padlock removed from the church, which was then reconsecrated. In 2000, I had the unique opportunity to photograph the church in both summer and winter. For a few years thereafter the church was open for worship, but preservation efforts have forced parishoners to move to a small house for services. Two years ago, the church structure was disassembled for a thorough restoration, but work has since been halted. If current problems are resolved, there will be hope for the preservation of this masterpiece. Despite its difficulties, Kimzha has, for the time being, found a delicate balance between past and present. A slowly increasing number of artists and specialists in the history of the north visit the village; tour companies talk of the possibility of building a small hotel. The opening of the new road might bring new resources, but also new problems. Without a source of local pride and spiritual values, conservation will be questionable. It all comes back to the church that stood at the center of the village. Russian can ill afford to lose such remarkable treasures.